I bought this ring for my wife's birthday and she was immediately smitten, absolutely head-over-heels over it. She has yet to wear it out and not get some very flattering comments about it. Everyone asks her where she got it and of course I get all the compliments about having great taste. At first I was afraid that it would be too big and gaudy, but I must admit, it was a "perfect" size and looks great on her and is very unique. May I suggest you guys make a red and a green version of this ring, I'd definitely buy them for her. Thanks Stauer for making me look like a Hero! This ring is very beautiful...more than I expected. So glad i bought this. Have gotten many comments! When I buy costume jewelry I always try to get pieces that look like something that is within my budget. 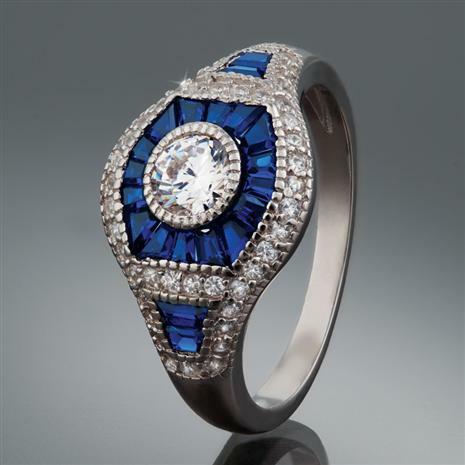 This ring is so unique that I doubt anyone would ever guess that it is a “Stauer” creation. It looks great on my hand. I’ve received many compliments on it and keep reaching for this special ring every time I go out. Classy, elegant but just relaxed enough to look good with just about anything you’re wearing. Like another reviewer commented, please make this ring featuring a green and red stone. I’d like to add those colors into my ring collection. I've had my eye on this one for a long time. Waiting for the 'out of stock' to go away, the ring finally came back and I went for it. Absolutely gorgeous. The spinel really does look like sapphires and the diamond auras are sparkly. Keep in mind, it's not as showy as the photo; more dainty-and sparkly! Love it. And I too would like one in rubies and one in either emeralds or helenite. I am a frequent Stauer customer and have been very happy with every purchase. They do great work. Spinel is a gemstone that at one time was most famous for being mistaken for ruby or sapphire. These days spinel gets the respect it deserves–– it is recognized for its excellent hardness (8 on the Mohs scale) and brilliance. So we wasted no time in creating a collection that would best showcase this gemstone in a way that’s both gorgeous and affordable. We hit the books and discovered that lab-created spinel is identical (if not better) chemically and visually than natural spinel. Once we got the gemstone the perfect shade of sapphire blue we put our designers to work to find the ideal setting. The vintage allure of the Art Deco style couldn’t be more perfect for our blue marvel. And, to really make the brilliant blue pop, we added the sparkling glamour of another marvel–– our signature DiamondAura®. The other marvel here is the price. This new spin on an eye-catching look is pretty marvelous, any way you look at it.